One photo a day for 365 days - one year! I've wanted to try this for a long time so here we go. Surely I will struggle to find subjects to shoot but it will be interesting to see how it works out. I don't expect my best work, but I do expect to sharpen my eye to see more around me, and hopefully the process to compose the mundane will improve my photography overall. I will try and post my shots at least a couple times each week if not better. Enjoy. 12/31/07 – This is my last shot for Project 365. Since my first shot was of me it seemed appropriate to end with this image. We went to the Raymond’s for New Years Eve. We ate, played games and had some good laughs. This was taken at midnight as we welcomed in 2008. HAPPY NEW YEAR! This was a fun project but I have to admit I’m glad I’m done. I’m sure I’ll continue for months to look for photos. 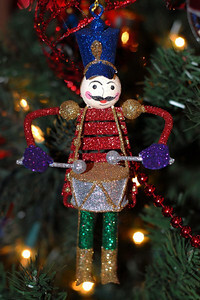 12/30/07 – We were at the neighbor’s home and they have some of the best Christmas decorations. I captured images of several of them but this one on the tree was one that was obviously special to them because they asked me to try and shoot it. I don’t think you can ever have enough Christmas decorations. Of course now comes the time to put them all away. 12/29/07 – We’ve had so much fun playing Wii I went out and bought one, but it wasn’t easy. They’ve been sold out for weeks in the stores and the online sellers wanted hundreds of dollars more than retail. I found one online that was very under priced and the seller happen to be about 2 miles from our home so I rushed over and paid cash for it before he could get a better offer. I only paid $22 more than retail, so I felt very good about the deal. This is Lisa playing Tennis with Jessica. You can get an excellent work out just playing these games. 12/28/07 – Logan and Kristen only have one car right now so Logan has to pick Kristen up at work. He popped into my office before they left and I snapped this shot of him using the new lens I mentioned yesterday. It is one of Nikon’s fastest and sharpest lenses. I’m looking forward to many great images with this new lens. 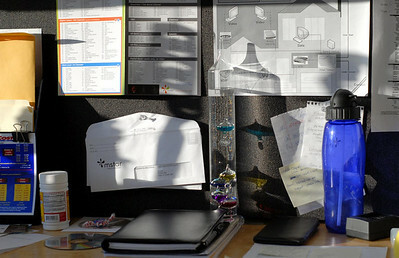 12/27/07 – This is late afternoon in my office at work. I was trying a new lens I bought (50MM F/1.8). I was looking for something to shoot and saw the shadows the setting sun was casting and shot this image. 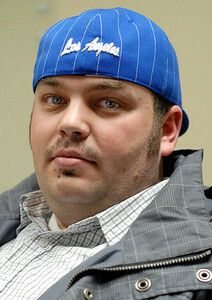 12/26/07 – This is Jay Gould, Ben’s brother (Mstar CEO). I send Jay out to angry customers. He looks scary but is a real teddy bear. People just love him, and Mstar, by the time he is done. 12/25/07 – Photo 6 of 6. 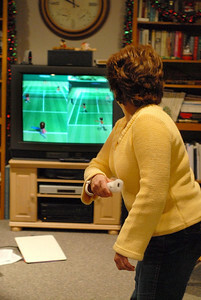 We spent Christmas evening playing Wii at my parents' home. We laughed so hard. This is very physical and Jessica (bowling in this shot) is extremely competitive. Nobody beat her in bowling. 12/25/07 – photo 5 of 6. We went to dinner at my parent’s house in the afternoon. This is my sister Danna’s dog, Yvette. She had him dressed up like Santa. She appropriately slept under the Christmas tree. 12/25/07 – photo 4 of 6. It snowed Christmas Eve ensuring we had a fresh white Christmas. 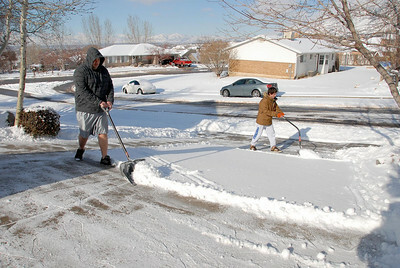 After brunch Logan and Sean went out to clear the driveway. It was around 20 degrees so I don’t know how Logan did it in his shorts. 12/25/07 – photo 3 of 6. 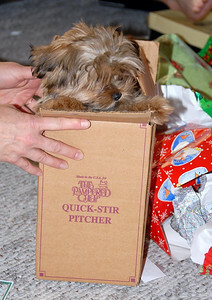 Even the dogs got a few Christmas toys and enjoyed playing with them Christmas morning. 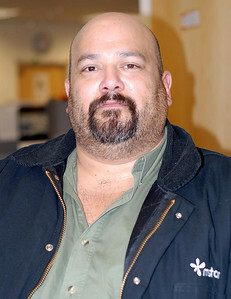 12/25/07 – photo 2 of 6. Oslo was crawling through all the wrapping paper sniffing for something to eat. Lisa put him in a box just for fun. 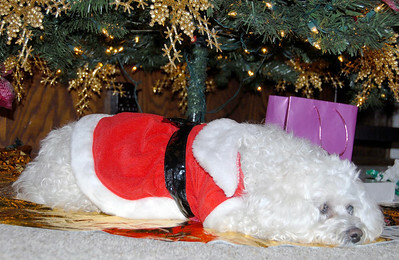 12/25/07 – photo 1of 6. There were too many fun photos for today so I’m posting six shots. This was Christmas morning. We stayed up so late Christmas Eve we didn’t get up until after 10am. 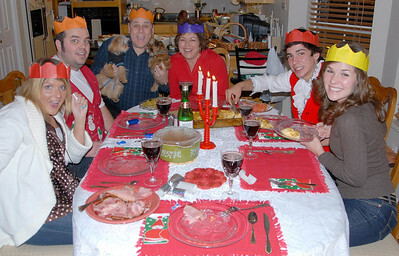 12/24/07 – This is Christmas Eve dinner. We mixed our family traditions with Kristen’s family traditions. The colored crowns are Kristen’s. We had a great evening eating, playing games and watching movies. 12/23/07 – I had to take this picture because Oslo was so cute in his little sweater. 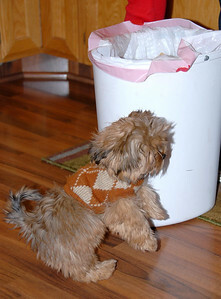 He was actually trying to get into the garbage. We were cooking and he knew there was something good smelling in that white thing. He was just too short to see inside. 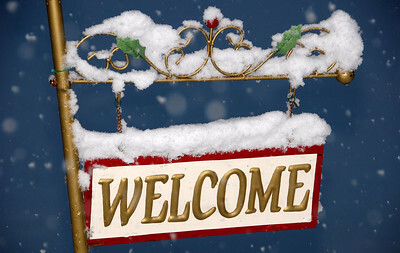 12/22/07 – We had a fresh dusting of snow on the front porch. 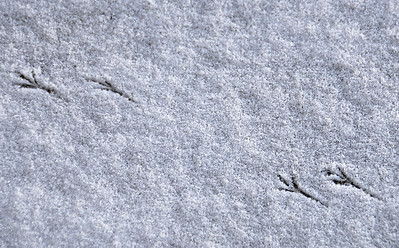 When I opened the door I could see that a small bird had been hopping around leaving tracks in the otherwise flawless snow. 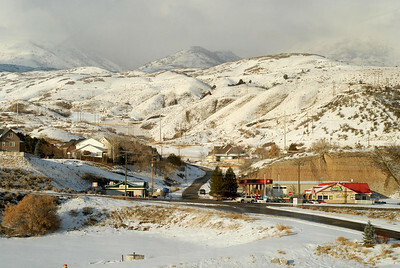 12/21/07 – Today we drove to Logan to see Lisa’s parents. 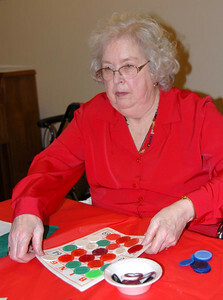 In the evening we joined them for a little Bingo action with the rest of the residents at Logan House. Lisa’s mom is getting ready to clear her board after a game of Blackout. 12/20/07 – We continue to get more and more snow. With my office so close to the mouth of Provo Canyon it has snowed a little almost every day. 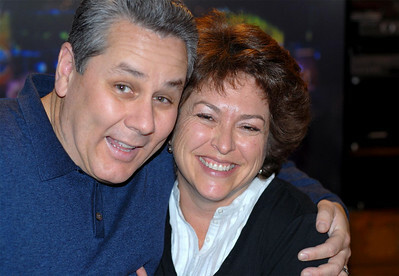 Today was our work Christmas party and my 27th wedding anniversary. 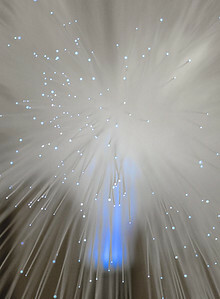 12/19/07 – This is a detail shot of a fiber-optic desk light. I shot it with very little depth of field so the light at the end of each fiber was in focus but everything else was out of focus. 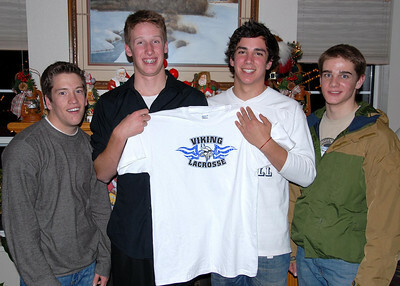 12/18/07 – Sean and his friends got together to shoot this shot for their friend Scott who’s in Italy. His Dad is serving as mission president in Rome. The guys got Scott this shirt and sent it with the photo for Christmas. 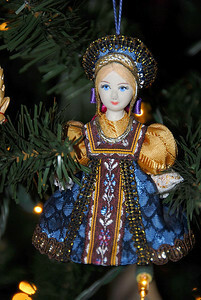 12//17/07 – When we were in Ukraine in 2004 we found these little dolls in traditional dress. 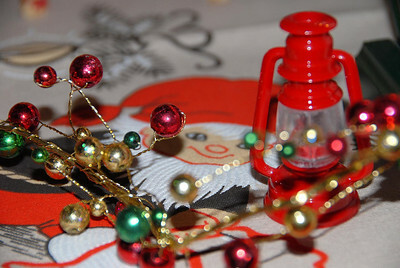 Lisa uses them as tree ornaments. I think that is what they were designed for. 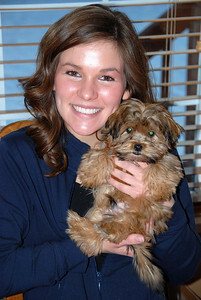 12/16/07 – Kristen and Logan came over for Sunday dinner. Oslo and Chip came as well. Jessica couldn’t resist cuddling with Oslo at the dinner table. 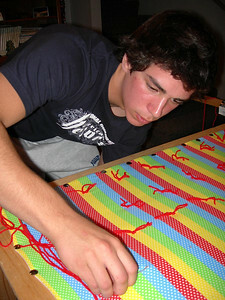 12/15/07 – Sean wanted to make a quilt for a “friend” as a Christmas gift so Lisa set it all up and got him started. He did most of it himself. We hope his “friend” appreciated it. 12/14/07 – Chip and Oslo came over to visit. 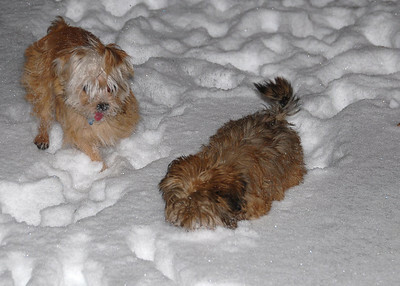 Chip loves to run and play in the snow. Oslo tried it but his legs are a little too short as you can see in this shot. 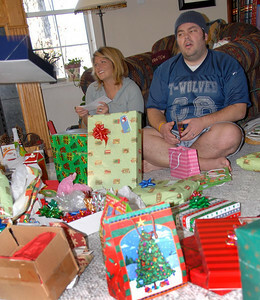 12/13/07 – Lisa does a great job of decorating for Christmas. The little elf character is Finnish. 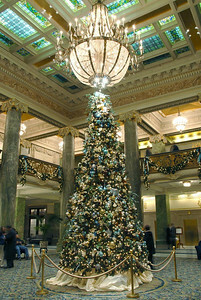 12/12/07 – This is the Christmas tree in the Old Hotel Utah, now the Joseph Smith Memorial Building. This is the lobby of the building. It is east across the plaza from the Salt Lake Temple. 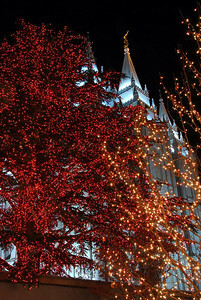 12/11/07 – To get into the Christmas spirit I wanted to go to Temple Square in Salt Lake City. Lisa went with me. It was very cold but I got several good pictures. This was one of my favorites. 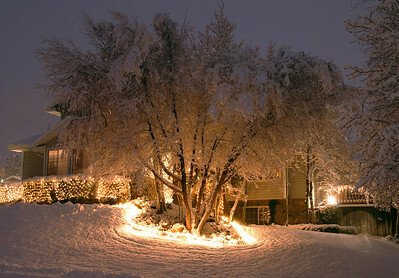 12/10/07 – As cold and snowy as it is, this image for me is so warm and inviting. There’s something charming about the shot. I would expect it outside Santa’s workshop at the North Pole but you’ll find it at our front door. 12/9/07 – I had to quickly grab a camera to get this picture of Lisa. 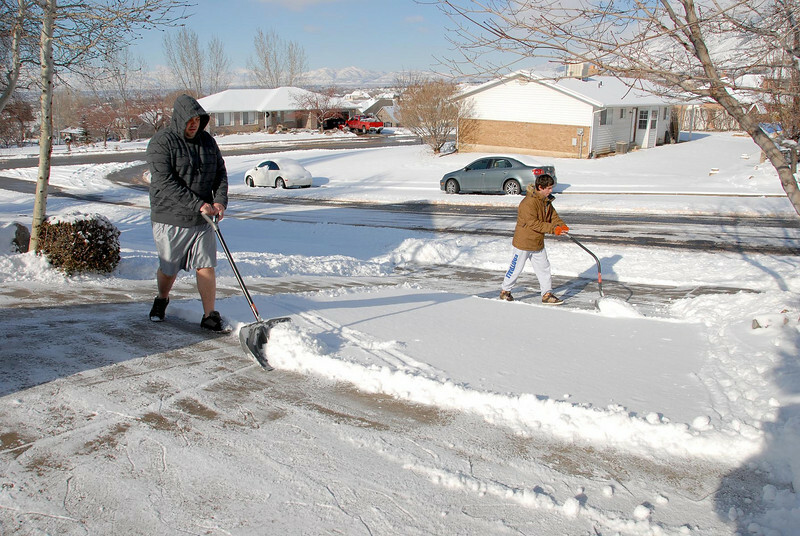 She was all dressed up and ready for church but couldn’t resist picking up a shovel to clear a little more snow from the driveway and sidewalks. 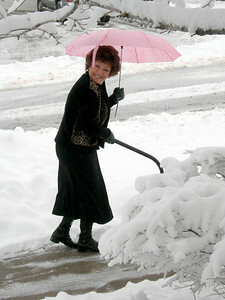 I had to laugh at her because of the pink umbrella in one hand and the shovel in the other that made it awkward to control either. 12/8/07 – This is another of those images that makes me feel like I’m in the mountains. Less than a couple hours after I shot this I noticed the heat of the light had melted all the snow off . 12/7/07 – I love it when the snow sticks to the branches of the trees like this. It makes me feel like I live up in the mountains. 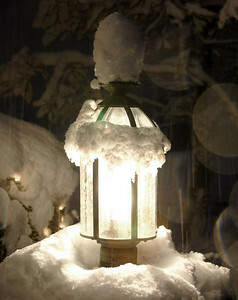 There is a charm that only lasts a few hours before it warms up and falls to the ground. 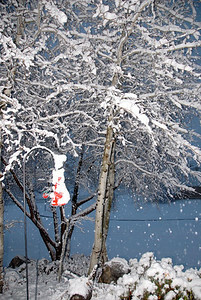 12/6/07 – We’ve had very little snow as we creep closer to Christmas but this storm hit us hard and looks like it will continue for a few days. 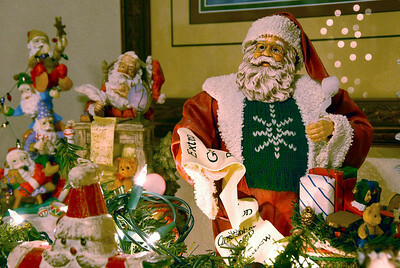 12/5/07 – Lisa has the home decorated for Christmas. One of my favorites is her collection of Santas and elves on the fireplace mantel.